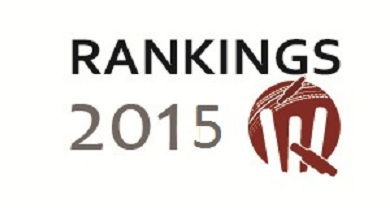 The ODI Batsmen’s Ranking 2015 is out! Well January is back, and so is the Tenth edition of Vineet’s Cricket Rankings (check out the ODI Batsmen Rankings 2014 here)! AB de Villiers (SA) remained at the top for another year. He claimed the top spot with 1193 runs from just 20 matches with an even high average of 79.53 and a higher strike rate of 137.91 than last year. He smashed 5 centuries and 5 half-centuries on the way to achieving this. BRM Taylor (Zim) smashed 2 centuries and 1 half-centuries on the way compiling 433 runs in just 6 matches at an astounding average of 72.16 and a strike rate of 106.91!! Sangkarra (SL) retired this year in style coming in 3rd – He scored 862 runs in just 14 matches he played at the highest average of 86.2 and a strike rate of 102.86 to come third. He scored 5 centuries and 2 half centuries doing that. Shaiman Akhtar (UAE) creeped in at Number 4 with 438 runs from 8 matches. He scored at a strike rate of 91.05 at an average of 57.25. He struck 1 centuries and 4 half-centuries on the way! Shoaib Malik (Pakistan) was No 5 position with 607 runs in 15 matches and an average of 67.44 and a strike rate of 108.39. He struck 1 centuries and 4 half-centuries on the way! But then who are the teams of 2015? Well South Africa and New Zealand both had 5 batsmen in Top 30! But South Africa was better with a South African leading every New Zealander in Top 30! Australians were next with 4 Batsmen in Top 30! Where are the top 5 batsmen of the year 2014? We saw de Villier continue to maintain his form to the highest level. He’s made this 7 times consecutively, which makes him the most consistent Batsman of them all in the 2009-2015 period. Virat Kohli lost his spot in Top 5! And the Indians? Indian batting lost it’s way in 2015. All Indian Stars performed lower than earlier with the exception of Ambati Rayudu who move up from No. 47 to No. 39 which was no great achievement. *These rankings are based on Players whos played 5 matches or more. These rankings are prepared solely by myself based on owned algorithms. These have no relation with ICC or any other rankings calculated elsewhere in the world. ODI Rankings 2012 are out!